Most people assume the self-employed professional can take off whenever they please or take work with them, combining business and pleasure as a luxury traditionally employed folks don’t have. That’s a myth. 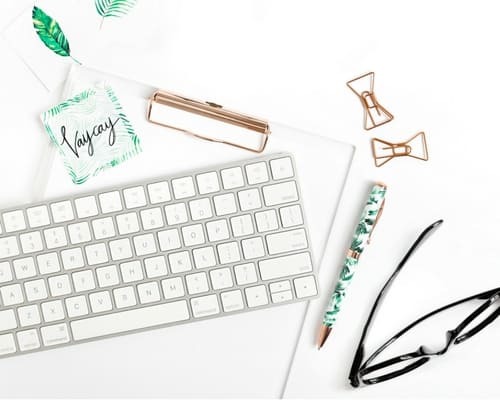 With time and technology at your fingertips, you’re busy trying to take advantage of every second you have to make your readers and clients happy. Whether you’re getting started or are established, your hours can vary wildly, and that’s a boatload of stress that needs to take a dive off a short pier. The typical traditional full-time employee only takes half their vacation time annually, and to boot, those who do take vacations can’t stop thinking about work when they’re away to practice self-care and relax. There’s a level of hard-to-quit guilt that comes with putting in the request for time off, and when you’re self-employed, it feels like that number triples. Self-employed workers shouldn’t feel guilty about taking time off to release stress, but how do you do that when you work for yourself? If you are your worst critic, then it stands to reason that the most demanding boss you’ll have is yourself. You can’t just dock your projects, type an email that says, “Peace, I’m out” and expect folks to still show up — can you? The answer lies in accountability, transparency, and follow-through on a well-thought-out plan — and just doing it because you need the time. First off, you need to get over this addiction to a hard work ethic equating to working yourself to burnout and an early grave. How long ago was your last vacation? Did you enjoy it, or did you spend time thinking about work? Of small business owners in 2014, only 57 percent planned to take off, and that only consisted of a few days. Time off is wasted money in many entrepreneurs’ eyes, but if you don’t take time off, you risk getting stuck and not growing personally or professionally. Need reassurance? Here’s some science: Time off equates to higher productivity. Attention-restorative therapy (ART) increased performance and focus in one study where college students walked in nature versus on busy city streets. Natural environments are more stimulating. Getting away from the hustle and bustle sparks creativity in the brain when exposed to the new versus the familiar. Don’t forget sleep! Vacation benefits you when you return to home and work, earning you at least one extra hour of sleep a night, and reaction times also increase by 30 to 40 percent. Watch those response times on your business Facebook page climb! It’s worth it to invest in yourself. Give yourself permission, and make a plan to take time away. While you may need a few months to get the hang of a new skill, you only need a day to reset and remember how to breathe between eating, typing, and everything else. If wired tight to your business, you’re going to need more time away, but a day gives you time to detangle and reconnect yourself with your needs, passions, and the world. There may come a time where you have to apologize to readers and clients and just take a day. When that happens, do your best to inform everyone through relevant communication channels, such as by phone, text, email signature, and social media. It’s best to plan the day in advance. Look at your calendar for the next week or month and negotiate with yourself. What part of your workload can shift? Pick a day for something you want to see or do, even if it’s a little trickier to navigate. Highlight the entire day in blue to symbolize stillness and possibility. Break large projects up into steps to accomplish in advance and begin to notify others about the big day off. Send a reminder the day before, and set up online profiles and sites to let others know it’s your time away. Taking a day off is more cost-effective and less stressful because your worry won’t grow as much as it would during a more extended time period. You’ll learn to appreciate the flow of the day and find those breathing moments of life between tasks for work. It may help you better understand how to structure your workflow and optimize it for whole health needs and productivity. There are meatless Mondays, and there are Me Mondays. Though self-employed, your schedule is booked for the week, and the weekend is for everything and everyone else. You’re not sure how you fit it all in, but you do — usually at the expense of sleep, food, and personal time. Working on a Monday is the worst according to scientists, too. You’re more likely to have a heart attack on a Monday and weigh the most. Women are also more likely to feel down about themselves on Mondays. Interestingly, Monday is the best day to change an aspect of yourself or your day — why not make that about self-care and proclaim it Me Monday? Take a load off your mind by making sure someone will be there to handle the essentials while you’re gone, such as answering basic questions, and replying to emails. Some of this can be automated through emails and informational uploads posted on your site, but most people prefer a human touch — a bot can’t do that. Outsource the basics to a virtual assistant, temp, or intern. With a little training, they’ll reply with detailed information to readers and clients, and keep you in the loop about the shifting needs of your business while you’re taking time off. Spend at least a week taking note of your essential daily business activities to assign, as well as minor tasks that absorb your time. Who knows? You may end up retaining assistance for the little things. Remember to outline your expectations on frequency and content of communication with your clients and you as the boss, too. Outsourcing the basics with confidence will make you less likely to remain wired to your business instead of enjoying your vacation. Productivity gurus tell you not to multitask, mix business with pleasure, or combine everything, and you’ve probably talked or written about it yourself. You’re also likely guilty of doing it too! Everyone does it, no matter what they advocate. So, if you’re going to do it, you might as well make a strategic plan of attack. Know how you work and what you need, and honor that. While you may prefer to work and have fun in bursts or be on a conference call while watching your kid ride a roller coaster, is that really the way you want to spend your time? Effectively combine business with pleasure by dividing your time into bigger chunks, like doing business in the mornings before the kids get up and saving the afternoons and evenings for family and personal time. Afternoons can be a mix of both. If you know you’ll spend an entire weekend at a networking event, add a Monday and Tuesday on top of that so you can enjoy yourself with personal time. Going back to work after vacation is its own form of jet lag, whether or not you transitioned time zones. Book time off for a readjustment period. Give yourself time to unpack, meal prep, sleep, practice self-care, and catch up with friends and family. If you set aside money for self-employment taxes, then you can set aside money for time off, too. It may take you a little longer, depending on the length of time off, but have confidence. Factor in “paid time off” into your rates to make up for a couple weeks of no business. Set the rules now so you can have fun later. You’ll also need to account for your regular expenses, such as your mortgage/rent and utilities. Stick to a budget during your time off and allow yourself little splurges. 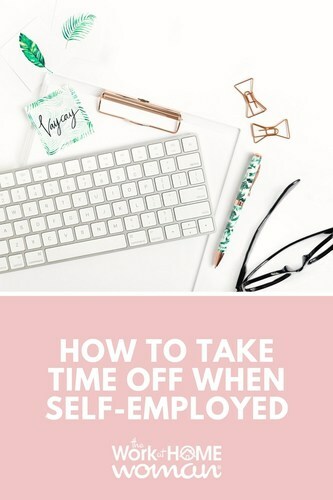 Taking time off when you’re self-employed can feel worse than requesting time away as a traditional employee because you need your own permission. Take it — you need to relax and grow, and besides, science says you’ll improve your creativity and productivity. It turns out you have nothing to lose unless you keep sitting at your desk. So, break out the suitcase and do more than dare to dream about getting out of Dodge. Do it. If I Don’t Work, I Don’t Get Paid – Is It Okay to ake a Break?